Alex Mortimer | Fretted Americana Inc.
2005 Alex Mortimer "Move Over Rover And Let Jimi Take Over"
MORTIMER, Alexander (Artist). Move Over Rover And Let Jimi Take Over. 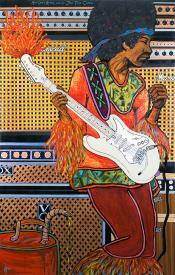 An Original Portrait of Jimi Hendrix. 2005. Acrylic paint and ink on canvas, 76 x 48 inches (1930 x 1219 mm). 2005 Alex Mortimer "Highway 61"
MORTIMER, Alexander. Highway 61. An Original Portrait of Bob Dylan. 2005. Acrylic paint and ink on canvas, 24 x 32 inches (610 x 813 mm). MORTIMER, Alexander. Satisfaction. 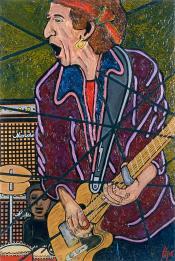 An Original Portrait of Keith Richards. 2005. Acrylic paint and ink on canvas, 30 x 20 inches (762 x 508 mm). MORTIMER, Alexander (Artist). Bang a Gong (Get It On). An Original Portrait of Marc Bolan. 2004. Acrylic paint and ink on canvas, 30 x 20 inches (762 x 508 mm). MORTIMER, Alexander (Artist). Slowhand. 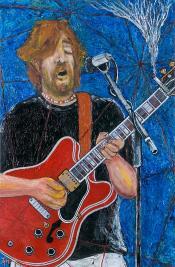 An Original Portrait of Eric Clapton. 2004. Acrylic paint and ink on canvas, 32 x 21 inches (813 x 533 mm). 2005 Alex Mortimer "Riffin' in Deep Purple"
MORTIMER, Alexander (Artist). Riffin' in Deep Purple. 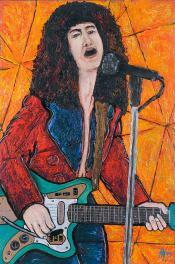 An Original Portrait of Ritchie Blackmore. 2005. Acrylic paint and ink on canvas, 20 x 30 inches (508 x 762 mm). 2004 Alex Mortimer "The Windmill"
MORTIMER, Alexander (Artist). The Windmill. 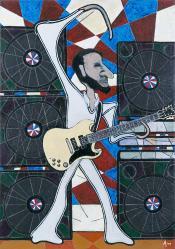 An Original Portrait of Pete Townshend. 2004. Acrylic paint and ink on canvas, 30 x 20 inches (762 x 508 mm).